Happy Bloggers Challenge Friday! With Mother's Day this weekend, today's Bloggers Challenge Theme is to create something for Mom. I'm sure the BC players must think I'm losing it, giving them this challenge on the Friday before Mother's Day. When I sat down to create my card, I did want to kick myself, after all, just how many Mother's Day cards does one need to create? So feel free to create a "girlfriend" card, I consider my mom a "girlfriend"! While I was tempted to go that route with my card, I opted for a nice Watering Can full of flowers, and just the sentiment Mom, so I can use it for any occasion. All stamps are from Our Daily Bread Designs, the Watering Can is stamped in Black Archival on Watercolor Paper, then colored using the Marker Water Coloring Technique. If you stopped by earlier this week, you'll notice I pulled out my newest favorite tool again. The edges are distressed using the Distrezz-it-All, I sure do love this thing! My family still can't understand what all the noise is coming from my studio, they said they never knew stamping could be so loud! Looking for more inspiration, click on the Bloggers Challenge Logo on my sidebar to see what the other members created this week. Beautiful, Luv the vintage feel and the beautiful flowers. Can't believe your family hasn't tried the Distresser yet, lol! This is gorgeous Lisa. That stamp is so beautiful and your coloring is impeccable. I'm going to have to check out the Distress it All. I haven't seen it in action. Beautiful image. Unbelievable background. Such a beautiful vintage feel. Love how you used the Distrezz-it. I love mine and am learning so much from you. Pretty! You've got the distressing and vintage look down! Your watercoloring is wonderful! Gorgeous water color, excellent layout! I love it! This is beautiful Lisa. I love the watering can with the flowers and your watercoloring is wonderful. Love the distressing too. Tbis is a perfect choice for many occasions...it is beautiful, Lisa. I love flowers and that old watering can is wonderful. TFS. Hugs, Gayle. Love the rustic feel to this. Great background, coloring and design! This is truly one of the most beautiful images I've ever seen. I've got to get on this train with Our Daily Bread Designs -- love the spiritual verses but the images are fantastic as well! Gorgeous -- your coloring is superb! I bought this stamp in St Charles- need to get ink on it- your card is gorgeous! I love the distressed look! Happy Mother's Day Lisa! The flowers in the watering can are colored beautifully!!! Hope you have a wonderful Mother's Day GF!!! 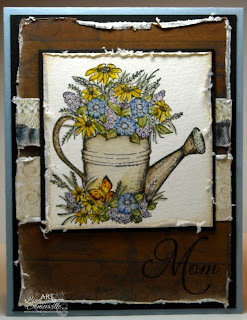 Love all the texture and feel to this card Lisa! Great coloring too. The distressed look suits this image Lisa. Lovely. How beautiful, Lisa! The watercoloring is lovely. Think I may have to try that distressing tool...Yes your mom is everyone's girlfriend...she rocks..
TFS and the wonderful Challenge. Love this. That disstresser is so cool...really completes any vintage look! Lisa--I LOVE it! Great Vintage look to it and belongs right outside our doors now that it's Spring. just beautiful! glad you are having fun with your new toy! mine scares me a bit...hahaha! 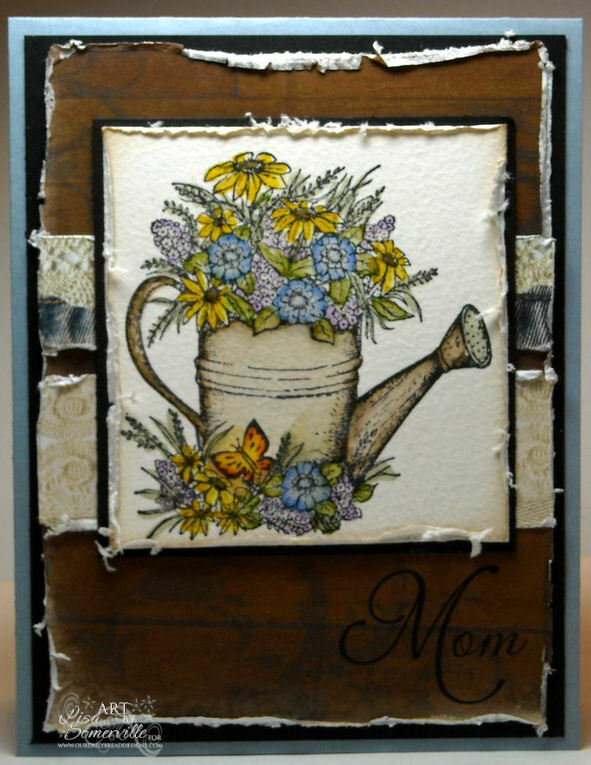 What a beautiful distressed card!! Very beautiful...love that watering can filled with flowers! Gorgeous effect of your coloring! The colors really pop! Lovely card! So pretty! Love the distressed edges!! I love this image! You really brought it to life with the great coloring. Love all the distressing too. Hope you had a great Mother's Day! OHHH--love the distressed look on the sides...and I love how the can has flowers coming out of it! Super pretty! Great job! Great coloring too!